Universal Health Coverage (UHC) has a crucial impact on people’s health and welfare. General good health impacts the lives of adults who can thus be active contributors to their communities, as well as children who by completing their studies, prepare a more skilled society in the future. The central principle of UHC is equality. The full coverage of needed health services is entwined with adequate protection against financial risk. Health-related financial backing is not only a government problem but also involves society as a whole. As such, risk should be widely shared by collecting large pools of funds for non-discriminatory use, meaning without any form of out-of-pocket disbursement and irrespective of people’s ability to pay. Governments have a duty to sustain the system and ensure open access to health facilities to disadvantaged, marginalized or stigmatized members of the population including, among others, women, children, the aged, prison inmates, male and female prostitutes, homosexuals, and rural area inhabitants. UHC and the Millennium Development Goals (MDGs) are strictly connected. As mentioned above, UHC implies open access for all to health services, and involves strengthening efforts to improve the quality, availability and affordability of services linked to the current MDGs including, for example, the fight against HIV/AIDS, TB, malaria and child and maternal mortality. For these reasons, UHC has been seen as instrumental in achieving progress towards MDGs, while being equipped to address the growing threat by non-communicable diseases, mental illness and injuries. Basic sanitation is still a mirage for most. Since 1990, 1.95 billion people have gained access to improved sanitation facilities, but, in 2012, about 2.5 billion people still lacked access. Admittedly, the current rate of progress is insufficient for global sanitation targets to be met. Looking at the under-five mortality rate, deep gaps between high-income and low-income countries still persist. WHO data report 76 deaths per 1000 live births in less developed countries, meaning almost 13 times higher than in the developed nations. However, the under-five mortality rate has decreased worldwide by 53% from 1990 to 2015, dropping from 90 to 43 deaths per 1000 live births (Table 1). Unfortunately, this progress is unevenly distributed, with the highest share of infant deaths still falling on the African region. In 2014, the World Health Assembly in resolution WHA67.10 endorsed the newborn health action plan, which provides a road map of strategic actions for preventing newborn mortality and reducing maternal mortality and stillbirths. Subsequently, several countries developed new or implemented national plans for newborn health. With regard to the fight against maternal mortality, HIV/AIDS, tuberculosis (TB) and malaria, important results were reached as well. -Concerning the first point, the mortality ratio globally decreased by almost 45% between 1990 and 2013, a key, though still insufficient result in order to achieve the target of 75% reduction by 2015. Moreover, 13 countries showing the highest maternal mortality rate in 1990, fell short of progress. And like under-five mortality, also the maternal mortality issue shows regional inequalities, with the African region accounting for the greatest ratio. -At the end of 2013 almost 12.9 million HIV infected people received antiretroviral therapy. Of these, 11.7 million were living in low and middle-income countries. This data aligns with an increase in availability of antiretroviral therapy and a decrease in the number of newly infected people, the HIV mortality rate has dramatically declined. In 2013 HIV/AIDS deaths were 1.5 million, down from 2.4 million registered in 2005. -Likewise, the estimated number of total malaria cases fell to 198 million in 2013 (from 227 million in 2000), the majority of them still being registered in the African region. What’s more, in the same period the mortality rate decreased by 54%. Overall, these results have been made possible through an aggressive policy largely based on insecticide-treated bed nets as the most effective method for vector control. Needless to say, the African region should strengthen further this policy since almost 278 million people at risk in sub-Saharan Africa are still cut off from insecticide-treated bed nets. Nevertheless, at the global level things are different. Indeed, the MDG target to reverse the incidence of malaria has already been met, and 55 countries are on track to accomplish the objective of reducing malaria incidence by 75% before the end of 2015. -Meanwhile, the MDG target of halting and reversing TB incidence has seemingly been achieved worldwide. Indeed, the Americas and Western-Pacific Regions have reached the goal of reducing incidence, prevalence and TB mortality rate. Unfortunately, the improvements attained by the African, European and Eastern Mediterranean regions are not enough to match the targets. What to expect for the future? The current year is approaching its end and we still have a blurred picture: on one side we admire amazing policies and strategies such as UHC and MDGs, and on the other side we are faced with realities that are something different. Important gains in global health have been achieved worldwide, meaning that health coverage has improved almost everywhere and MDGs related to health have registered significant developments even in the low and middle-income countries. But what happens after the end of 2015? 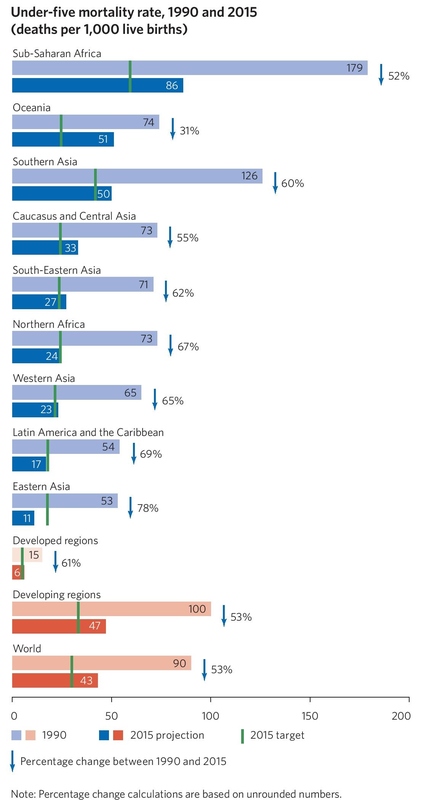 In August 2014, the “Open Working Group of the General Assembly on Sustainable Development Goals” (OWG) proposed 17 sustainable development goals (SDGs) with 169 associated targets. SDGs are based on fundamental principles such as economic development, environmental protection and social equity. In September 2014, the UN General Assembly decided that the proposal should be the main basis for integrating SDGs into the post-2015 development agenda. In that scheme, the health goal ranks high as an overarching aim amidst the other 16 SDGs. It includes nine targets: three relating to MDGs, three to non-communicable diseases and injuries, and three cross-cutting or focusing on systems encompassing UHC, universal access to sexual and reproductive health care services, and also to reduced hazards from air, water and soil pollution. The negotiating process for the post-2015 development agenda was divided into several sessions that ended at the UN meeting held on 27-31 July 2015 with an outcome document to be formally adopted on occasion of the Organization’s seventieth anniversary celebrations in New York (25-27 September 2015). Up to now, consultations on the acceptance of SDGs among member states were seemingly successful. Relevantly, the devil’s knot, how to finance the new sustainable development agenda, was a hot matter for debate at the Third International Conference on Financing for Development, held in Addis Ababa, Ethiopia, from 13 to 16 July 2015, where thorny subjects were addressed. Participating members reaffirmed their commitment to tackle global hunger, poverty, gender disparities, health issues (principally the achievement of UHC) and ecosystem degradation. To make this happen, mobilization of financial resources linked to capacity building was considered as a top priority that could be achieved only through a global partnership bound up with global solidarity. Consistently, in “Transforming our World: the 2030 Agenda for Sustainable Development: Outcome Document for the Summit to adopt the Post-2015 Development Agenda,” endorsed at the end of the above-mentioned 27-31 July UN meeting, the Member States agreed that resource mobilization is central to the “Agenda”. Notably, developed countries committed themselves to reversing aid shrinkage to the less developed countries, and the European Union undertook to increase aid to least-developed countries to 0.2% of gross national income by 2030. Moreover, the concept of global partnership based on the principle of “common but differentiated” responsibilities was reaffirmed as a cornerstone of the “Agenda”. Last but not least, the “Agenda” set out the list of SDGs that the UN General Assembly should permanently endorse in September 2015. What inferable criticism at first sight from the events and documents highlighted here? They clarified the action agenda that the governments have decided to follow until 2030. Yet, due to vague terms and the lack of unequivocal definitions, a number of relevant issues still lie in uncertainty. For example, what about the concern that the “Agenda” could hinge on voluntary participation? Not taking any bets at the moment, but there is room to doubt. On the “Agenda” and the Addis Ababa Conference report, governments agreed on the need to mobilize financial resources, but how could that be done? How are developed countries willing to contribute? To what extent? What political weight and influence will they maintain? The “Agenda” is focused on the concept of global partnership, but which one? Perhaps, a two speed-based partnership whereby the affluent countries are leaders and the less-developed ones try to follow them? In this regard, the concept of “common but differentiated responsibilities” needs transparent definition. No doubt the agreement documents highlighted above, and especially the “Agenda”, are political milestones for the post-2015, but their ambiguous terms should be addressed immediately if we want our societies to develop along shared pathways grounded on equality. "Universal Health Coverage, Millennium Development Goals And Post-2015: The Improvable Way Forward" by Intellectual Property Watch is licensed under a Creative Commons Attribution-NonCommercial-ShareAlike 4.0 International License. Yes, UHC is essential to deliver quality healthcare to all. That is what the health MDGs needed and what SDG3 will need to be successful. Since the 1978 Primary Health Care conference, WHO knows that. World health is monitored and improved through programs that address various health priorities that vary from country to country and within countries and regions. WHO knows that. Healthcare, on the other hand, is delivered by healthcare workers and professionals through services that meet the needs of these priorities. WHO knows that too. It is time we use all that knowledge and technology we have not to fight diseases but to strengthen health systems so healthcare workers can deliver services that meet the needs of the communities they serve.